Sometimes the color chart links aren't showing up. Ketones trace to small---contact your vet. Ketones above small to moderate-----EMERGENCY TREATMENT NEEDED! Ketodiastix will let you monitor the amount of glucose in Princess' urine as well as check for ketones. You need to know how much glucose is in the urine and if there are ketones. When ketones are present, they can be an emergency situation. They will also help you keep track of how Princess is doing once she starts on insulin. Many people do blood glucose testing on their dogs and cats, just as persons wth diabetes do for themselves with meters. You don't need to worry about this right now--using the Ketodiastix will let you keep track of how Princess is doing. "Keto-Diastix Reagent Strips By Bayer Urine Test for Ketones. Ketone is a substance which is usually not harmful when found in small amounts in the urine. 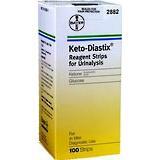 Keto-Diastix Reagent Strips By Bayer Urine Test for Glucose. These are the basic test strips for testing for Glucose in the urine. The strip turns a specific color and that color is matched to a color chart on the Diastix bottle. This is an alternative to blood testing for glucose." This is a link to a page on ketones and ketoacidosis and why can be so dangerous for those with diabetes. Ketones: When there's not enough insulin, the body begins to break down fat cells, which produce fatty acids. These fatty acids are passed through the kidneys into the urine--we know them as ketones. "Urine monitoring is also a quick and easy method of detecting ketones (ketonuria) and hence a potential emergency - see diabetic ketoacidosis." I think your idea of seeing your sister's vet as soon as possible is a good one and believe I would continue on with what Princess has been eating until you see the new vet, who may have some suggestions as to what he/she would like to see in the way of a diet for her. The sooner you get some bloodwork done for Princess the better because I believe she does have a urinary tract infection. Most of the time that makes the blood glucose go quite high--treating them brings the glucose levels down. With some of our diabetic dogs, the higher than normal bg's are often the first sign there's an infection that needs to be treated. I think once you get Princess' bloodwork done and start with whatever treatments she needs, things will seem a lot clearer than they might seem now. I see you mentioned that you are testing Kibbi's first pee in the morning with the Ketodiastix. This can give you a high reading. The urine collects glucose that washes out of the blood when BG is over 180. The first pee represents urine that's been collecting glucose for several hours. I always test after she's had her morning pee. When she gets regulated her urinations will be less frequent so you'll have to be on your toes. Lucy was still getting urine readings in 500-1000 range when her BG's were in the 200s to 300's. Even though we home test her BG I still use the Ketodiastix to watch for Ketones. I use these once a month with Niki, or if I feel something is wrong or off with her. It is known that vitamin C (ascorbic acid) can interfere with the oxidation reaction on blood and glucose test areas, resulting in false-negative test results. The test strips in the Chemstrip product line are protected against this interference. Thus, even high concentrations of ascorbic acid have virtually no influence on the test result for blood and glucose. All test pads are evaluated in the stable phase. Color reactions develop rapidly and in parallel, so timing is less critical than with conventional test strips. All pads can be read anytime between one to two minutes. Users have ample time to read and confirm results and an extra measure of confidence that results are accurate. Note: Chemstrip urine test strips test 10 different substances in the urine. You can see the prices vary, I wanted mine right away so I ended up with the Roche brand, Walmart price was about 35.00 I think. Maybe some could buy and share 1/2 bottle, they have to be in a secure dark bottle and are taller than the ketodiastix. This is a pic of the Multistix color code chart, I finally found one, some may split up a bottle being you need to buy 100 and to take the label off is quite impossible. If you click on the picture it gets bigger. This is a good article re: how to read multi-test urine strips and what the various results may mean. High bg's and ketones are the ones that go together. This is why you've seen Natalie and myself posting on the threads of members who are dealing with high bg's to make sure to do ketone testing. You can have good bg's and still see some ketones on a urine test, but they would be "leftovers" from an earlier high bg episode. An example would be--someone checks his/her bg's and learns they're quite high (for any number of reasons). He or she then decides to check urine for ketones and the test is positive. The ketones aren't serious enough for him/her to need the doctor or an ER, so he/she uses some fast or rapid-acting insulin to bring the high bg's down. After the extra insulin has gone to work, he/she checks his/her bg's again and they have returned to normal range. The person decides to check the urine for ketones again and finds a positive reading once more. The normal bg's from the blood testing say there are no more ketones being formed and these are ketones left from the earlier high bg problem which are now leaving the system via urine. You're absolutely right about what too much insulin does and that too much of it means a low or hypo, and you've "gotten it" well enough to manage Mik VERY well! BTW--the information on seeing ketones after the high bg problem has been solved comes from our old friend, Dr. Ragnar Hanas, the Swedish Pediatrician whose book, Insulin-Dependent Diabetes in Children, Adolescents and Adults, we refer to for things like the insulin depot. The ketone information is in another chapter of this book on Insulin Pumps. "Be aware that insulin deficiency leading to increased ketone production immediately shows up in the urine. If you take extra insulin, the production of ketones will stop. However, the excretion of ketones in the urine will continue for many hours but you will see that the concentration stabilizes and then decreases as the hours pass."